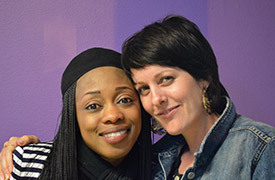 Artist Sarah Beth Woods and professional hair braider Fatimata Traore will work together to hold open studio sessions around Chicago, teaching hair braiding and fiber manipulation techniques using hair, cloth and plastic. During these sessions, they will document the process, samples, personal braiding stories of the participants to be included in a publication. Then, select fiber samples from the sessions will be assembled together to create larger sculptural works that blur the line of authorship between Sarah Beth Woods, Fatimata, and the participants, resulting in a new series of collaborative sculptures. Fatimata Traore is a Malian-American professional hair braider, teacher, and entrepreneur. Traore is president of the Illinois Association of Hair Braiders, a member of the African Political Action Committee and board member of Mali Relief. She has recently participated in Chicago based braiding events at the Gray Center for Arts and Inquiry, Hyde Park Art Center, and the South Side Community Art Center. Traore is a graduate of the National School of Administration Bamako, Mali. Footwork dancer Jamal “Litebulb” Oliver and filmmaker Wills Glasspiegel will use the Crossing Boundaries prize to develop a multi-part archival initiative that includes creating spaces online and in person where anyone can engage with and learn the history of footwork culture. 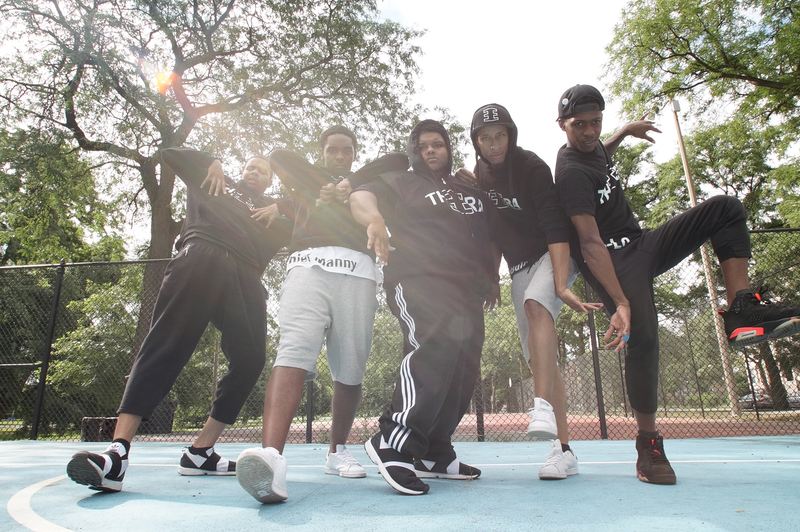 This documentation will then be incorporated into their performances and inform the creation of a musical family tree of footwork that tracks how it has spread globally and also the publication of a comprehensive map and genealogy of all the footwork dance crews that have performed in Chicago since the late 80s. Jamal “Litebulb” Oliver is an artist and footwork dancer from the South Side of Chicago. He co-founded The Era Footwork Dance Company in 2014, and has performed at The Barbican in London, Hive in Tokyo, and MoMA PS-1 in New York, among other venues. Oliver began his dance career at a young age with performances and footwork battles in Chicago. Footwork is an indigenous black Chicago dance that originated in the 1980s and has more recently spread in popularity outside the U.S. Oliver is a leading practitioner and ambassador of the dance form, touring and performing with the Teklife DJ collective and the late DJ Rashad. This year, he received a grant from the Chicago Dancemakers Forum to begin production of 160, a multimedia dance performance depicting Chicago from the perspective of a footwork dancer. Oliver's goals include changing the perception of dance, moving dance from the background to the foreground of popular culture, and helping to bring an end to segregation in the dance world and beyond. As an educator, he is dedicated to teaching footwork to anyone who wants to learn.